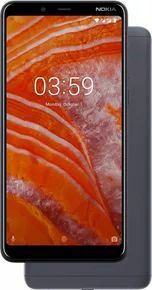 Nokia 3.1 Plus (2GB RAM + 16GB) expected price in India is ₹9,499. The Nokia 3.1 Plus is good looking and solidly built phone that runs stock Android and has a big battery advantage. On the downside, the performance hardware and camera are strictly mediocre. Overall, the Nokia 3.1 Plus covers most basics and is a fine phone, but since this is an offline phone, the pricing feels a bit off. The Nokia 5.1 Plus that costs lesser offers a similar experience, has a comparatively better chipset and retains most of what’s good with Nokia 3.1 Plus. The fingerprint sensor is fast and responsive, and connectivity options work fine. The Nokia 3.1 Plus supports Dual SIM Dual VoLTE as well. The Nokia 3.1 Plus feels compact for a 6-inch display phone. HMD Global is using an 18:9 panel with narrow side bezels. Unlike the 5.1 Plus there is no notch at the top, which could be both good or bad depending on your individual preferences. The camera finds it tough to focus on nearby objects and colors turn out a tad warm and at times oversaturated. The rear camera captures good details outdoors. Indoor, the camera performance deteriorates, which is something expected at this price point.